It has again been a lively winter in the global LNG spot market, with winter buying driving Asian prices above the 20 $/mmbtu level. There has also been strong competition from Spanish and Turkish buyers to secure Atlantic Basin cargoes. The knock on effect of Spanish LNG demand, has been a period of structural separation between gas prices in South West and North West Europe. It has again been a lively winter in the global LNG spot market. Spot prices are following a pronounced seasonal shape as winter buying has driven Asian prices above the 20 $/mmbtu level. What has been interesting this year is the level of competition from European buyers, particularly from Spain and Turkey, to secure flexible cargoes. The knock on effect of Spanish LNG demand, has been a period of structural separation between gas prices in South West and North West Europe. The Iberian peninsula is relatively isolated from the rest of the European gas market. Although interconnector upgrades are under development, there is a tight constraint on cross border capacity from Southern France into Spain. In turn there is another key transmission constraint separating the PEG Sud and PEG Nord hubs within France (as we describe in more detail here). So tightness in the Spanish gas market can drive quite pronounced price separation across the Spanish AOC, PEG Sud and Northern European (NBP/TTF/NCG) hub boundaries. Oil on the margin: Whenever possible, the incumbent gas suppliers in Spain like to ‘manage’ portfolio supply (i.e. pipeline & LNG contracts) at the Spanish borders such that oil-indexed contracts drive marginal gas prices within Spain. This is primarily because suppliers are selling gas to customers on an oil-indexed basis. NW European convergence: With increasing volumes of interconnection capacity to France and weakening Spanish gas demand over the last 5 years, NW European hub prices are increasingly influencing Spanish gas pricing. This influence will only continue to expand as interconnection increases. Spot LNG on the margin: In periods when there is a more pronounced shortage of physical supply into Spain, pipeline contract imports & interconnector capacity can become constrained. Spanish gas prices tend to rise to attract LNG supply as a result. This is not necessarily to attract spot cargoes, but to choke off the diversion and reloading of Spanish LNG supply to other higher priced markets (e.g. in Asia and South America). The impact of this third state (i.e. LNG spot influence) has been felt to some extent across the last three winters. It has been particularly prominent this year given issues within the Spanish market. A good way to visualise the impact of LNG prices on the Spanish gas market is to look at the evolution of a Spanish spot LNG benchmark. 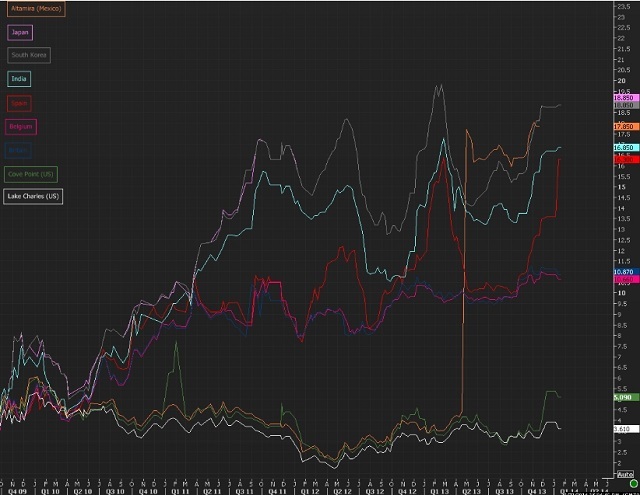 Chart 1 shows a LNG spot price snapshot from the Reuters power and gas team, displaying the evolution of different Waterborne spot price benchmarks. A lower bound of European hub price levels, broadly reflected by the blue (UK) and pink (Belgium) markers. An upper bound of west Asian spot prices, e.g. the Indian marker in light blue. During times of ample Spanish supply, e.g. Summer 2013, there is a broad convergence of Spanish prices with NW European hubs. However during the last three winters, Spanish prices have risen to attract an adequate level of LNG flow into Spain, given competition from Asian and South American buyers. There are a combination of factors this winter that have led to rising Spanish prices. Lower renewable (wind & hydro) and nuclear output has provided an unexpected boost to gas-fired generation volumes. In addition there have been significant Algerian production issues that have curtailed contract supply into Spain. Despite the current winter tightness, spot LNG prices are unlikely to remain the dominant influence in the Spanish market for long. As the current seasonal spate of competition for cargoes between Spanish, Turkish and Asian buyers dissipates, the pull of European hub prices will likely re-assert. Over the last 5 years, Spain has suffered a pronounced erosion of gas demand from economic weakness and a fall in gas plant load factors. Until these effects are reversed, periods of gas market tightness are likely to be temporary rather than structural. And an expansion of cross border capacity with France will only strengthen the pull of European hub price convergence.